I'm always a sucker for a trivia game, so you can imagine how excited I was to see Planet Green's new eco-trivia game online. 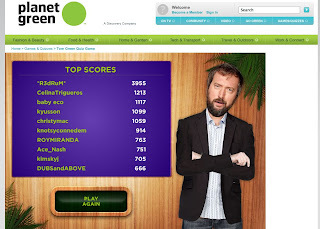 It's called the Go for the Green, hosted by Tom Green. The online game is a sidekick to the TV series which premiered on the Discovery Channel in November. I haven't made the online high score list yet, but it isn't for lack of trying. And I've learned some good facts in the process! Give it a try and let me know if you make the high score. I'd be so proud.